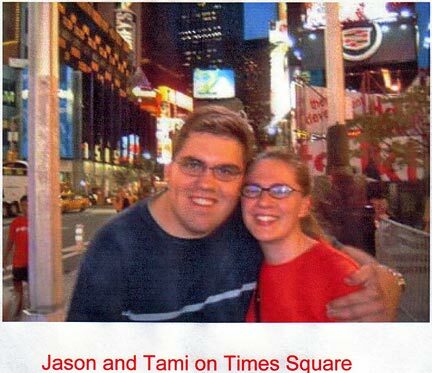 Announcement is made of the engagement of Tami S.Anderson, daughter of Janie and Dwight Anderson of Dwight, North Dakota, to Jason H. Hunt, son of Leonard and Diane Hunt of Elkhart Lake, Wisconsin. Plans are for a wedding at the end of June 2004. Donny and Patty Anderson decided to hop on their latest acquisitions -- a Harley Davidson (to be lead cycle driven by Don) and his hand-me-down Honda Shadow (which had become Patty's since the arrival of the "Harley") and head for the Ozarks. This is their travelogue, as told to the editor. We packed our saddle bags with enough clothes to get us to the folks (laundry to be done only once) , our maps, and a few other necessities -really quite a bit can be fit into the leather bags that fit to the sides and also to the ones strapped on to form back rests. We started early and started out along the Mississippi River-we had decided for the best scenery and the least traffic we would travel secondary roads as much as possible. We traveled at moderate speeds and were able to put 400 or so miles behind us by that evening. We stopped for overnight at a motel in Clinton, Iowa. We found that long a leg of travel was tiring and each day we would go only as far as was comfortable. We went from Clinton to Louisiana (which is in Missouri -- they have lots of confusing names --like Texas, Mexico, and etc.) We went right to the middle of the town and found a square where almost all of the buildings stand empty and boarded up -- but the one exception -- which we highly recommend as being well worth a trip off the beaten track, is Eagle Nest Inn where we ate and stayed overnight. We were now headed for one of the focal points of our trip -- We drove some really beautiful scenery, always keeping to good secondary roads. Sometimes not seeing much in the way of towns -- at last arriving at Steelville. Our destination was Wildwood Inn. The Inn is a renovated hunting lodge brought back to an exact copy of the original -- and many things in it are original to the 1920's! We had a great dinner there and then sat in the lobby for the concert of the Amazing Rhythm Aces, a 70's Country Blues Band. Great stuff -- 2 members are from the original group. We started the day with a great Southern -- or Mountain breakfast at the Inn. (You know -- biscuits and gravy, grits and that type thing) piping hot and served with country friendliness. "How about some more coffee, Hon." You know the sort of thing -- if you don't, then go traveling out into Southern Country sometime. This day we headed out to West Plains, as that looked on the map like it might have size enough for a nice motel to stay at and a good restaurant. It was also about half way to Springfield. We traveled lots of curves and hollows and saw lots of beautiful scenery; for a change of pace, we parked the cycles and went for a little hike down to a stream, saw some wild flowers -- they resembled our snapdragons. When we arrived at West Plains we found another town with lots of boarded up businesses but also did find a decent motel and restaurant. We had been noticing by the TV weather reports that rain storms were following close behind us, but we have kept ahead of them so far. This day we had to take some 4-lane travel, not the most popular with us. But we encountered no problem -- couldn't find a decent place to eat along this stretch and we had a rather late lunch break for lunch. Got onto the James River Freeway when we reached Springfield and arrived at the folks' place at about 3:30 this afternoon. We have our usual room and overflow bags go into Mom's computer room. Now Patty had to get busy with the laundry. (Cleaning squashed bugs off her jeans is a must.) Got in some updating and then ran into a little "why didn't we?" when Mom made a statement that she hasn't as yet seen any pictures of Eric and Leona's wedding. We never once thought of bringing any along -- a goof! In the evening, Pat and Linda and their daughters Kathlene and Molly came over for hamburgers and trimmings. Had a very nice evening going over news with the Blys. The girls would have really enjoyed a ride on the bikes, BUT the rain that had been following finally caught up and it poured for the evening. Jason is employed by the state of Wisconsin in Madison as a Nuclear Engineer for the Radiation Protection Section. He inspects facilities in Wisconsin that use radioactive material, such as medical (Nuclear Medicine) and industrial facilities, along with responding to incidents involving radioactive material. He has worked there for the past 3 years. Prior to moving back to Wisconsin, Jason worked in San Diego, California. Jason has two degrees: one in Health Physics (radioactive protection) and another in Business Management. His parents are Leonard and Diane (Anderson) Hunt. His Dad is from Washington originally and Diane is from near Oconto Falls,Wisconsin. They now live in Elkhart Lake, which is an hour south of Green Bay and an hour north of Milwaukee. Jason has one sibling, Lynae, who is 23. She started work in Wisconsin this year. Jason and Tami have known each other since May of 2000 and will be married in June of next year! Best wishes -- and welcome to our family, Jason! Well, when Hetty Hooper gets a story going, she'd better be able to count on her photo correspondent. I don't remember if Lori has put anything in the bulletin about this or not, but Lori's boyfriend Aaron is the Godfather of a little boy, Bryce Madsen (2 weeks older than Rylie), who has Spinal Muscular Atrophy. 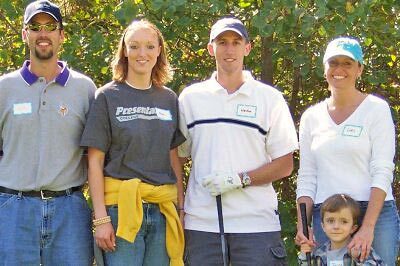 They, along with many of their friends, organized a huge golf tournament to raise money for Bryce and his family. They raised an unbelievable amount of money for the family. When they presented them with the oversized check after the tournament, there weren't many dry eyes. Anyway, hopefully Lori will write more later about the tournament, so I won't steal her thunder, and you'll have to wait to hear how much they raised (their goal was $5000). I was just setting the stage for where I was able to get a picture of Weston and Ana. Since the Bulletin is getting so big, I better put all the names in, just in case everyone doesn't recognize all the faces. On the left, that's me, Wyatt. Weston's new girlfriend Ana is next to me, then Weston, then Lori and Jayce. Jayce rode along for the entire 18 holes, and REALLY took a liking to Ana. He spent at least 9 holes on her lap! I know I promised silo filling pictures this edition, but they'll have to wait, since I wanted to hit this story while it was still hot! Wyatt set the stage, Lori is very busy, so I will fill in a few of the details. Saturday the 20th arrived with beautiful, 70 degree weather and sunshine. Which being it was sandwiched in between cooler, rainy weather, was a blessing. When, Caity, Kerstyn (my daycare girl, Caity's friend) Jayce and I arrived, Lori came over for a quick greeting. She and Aaron, along with other friends and family had set up an enormous amount of donated gifts. Some for a raffle, some for golf awards and some for bingo to be played by the non-golfers. They were also doing any other last minute details, of which there were many, as one of the other main couples had a family emergency the night before and weren't able to help in the morning. I want to say Lori, Aaron and friends did an awesome job, the day went as smoothly as possible, especially considering the extra twist of an emergency thrown in. A good time was had by all, and there were many there to help make the day a success, relatives, friends, Bryce's daycare and therapists, friends of the friends etc. A fantastic turnout in tribute to the little guy that tugged at our heartstrings. Taking you back three months, friends of Bryce's parents, which included Lori & Aaron, were wondering what they could do to help, after learning of Bryce's SMA diagnosis. Someone mentioned a golf tournament, but the proceeds would go to SMA. Another friend said they should give one of their own, with all the money they could raise going to Bryce. The race was on to accomplish their goal. And what a success! They got the golf course donated, the hog, someone to do it, food items and all the gifts to give, etc. Many people, much time and generous hearts made it success far beyond their goal. After the golfing was completed, a wonderful pork meal, with all the sides, including several desserts, was served. The next step to complete the lighter side of the day was pulling raffle names and handing out the golf awards. Then it was time to present the result of their hard work and the reason this day came about, in the process bonding people together in a new way and making new friends, from the collection of those that touch little Bryce and his life. Friend, Eric Speer, (the one with his wife's family emergency the night before) gave a lovely speech about the reason they had done the benefit and how it had come about, bringing most of us listening to tears. The oversized check that they put into Byce's parents hands was for the grand total of $14,782! Far exceeding their goals. I guess I've never written an update, and since my recipe file is SOOO forsaken, I will take mouse in hand and "give you the goods," as it were. I have been keeping busy working on a draft of a mission statement and financial plan for our new proposed restaurant. By "our" I mean mine and Phil Paulson's. Phil is a longtime associate and close friend who is currently the Executive chef at SCSU. We are also working on our sales pitch to potential investors, including a book-sized detailed draft of our plan and charts and graphs that are enough to boggle the mind. (Well, MINE, at least.) To be brutally honest, our plan is still in the "pie in the sky" phase, and it may be awhile before we see any concrete progress. We are both pretty busy with our "day jobs," but we work away at it like water on stone. Our concept is fine food, high-end dining, and we have already scouted several St. Cloud locations, including a renovated bakery downtown. While we work toward our common goal, we continue to do some "off the books" catering, including an upcoming wedding in Florida on Valentine's Day. This "gig" presents something of a dilemma, as that particular holiday is a very busy one for the Chanticleer, so I will have to make some decisions by then. It is really hard to turn down a job that pays airfare and accommodations to Florida in February! It is even harder to pass up when I consider that I could make in one DAY what I make at The Chanticleer in a MONTH! School has gone well thus far. Hopefully it stays that way. I really like my American Literature class and my Statistics class. Both have good teachers. I'm not so fond of my sociology class and my kineseology class ... The teachers aren't nearly as good as the teachers in the other classes. I spent last weekend in New Mexico again. I flew down on Wednesday after school and flew home on Sunday afternoon. I had a really good time. Ryan and I went hiking with their dogs and went to the dirt bike races, among other things. It was way too short, though. Next time I hope I can stay longer. Now I just want to ask you all -- Did I or did I not tell you there was something more than a search for education involved in all that traveling of little Tami Sue? -- I caught it from the boss who assured me that this was a serious minded girl in search of an education (some kind of fancy education, if you ask me.) -- I felt kind of bad because I guess they even ran an article on her trip to Central America to fit glasses on poor people -- very charitable, I am sure -- but that was before my day with the paper -- you couldn't expect me to have read it! And now I am vindicated. Just check out the Engagement Notices -- with a picture of them in Times Square --I ask you!! Suppose that is part of her education??? I really like that junior member of the staff -- I find he is a dependable snoop -- got me a neat picture of Weston and Ana -- I guess I can trust him to carry out assignments. I am beginning to like working here -- just met the boss's husband -- now that is one handsome looking fellow. (Sure there must be some mistake as he looks young enough to be her son.) Hmmmmmmmm -- wonder what might come of this???? I just read a statement by Doug and he says the blond he was with was Gwyneth Paltrow -- now I ask you -- it taxes my imagination -- Gwyneth is a little YOUNG for him I'd say -- now maybe Suzanne Somers, but in Dassel, I don't think either one of those beauts even know where Dassel is. For that matter, I doubt they know where MN is! I guess time might answer this one! But I would almost think we are being duped! I heard from my sources that the Ben H's trips to KC, MO were fruitless, Oh well, better luck next time, Ben, but keep Hetty posted and she'll let you off easy! Now the latest "Migratory Young" appears to be a couple juniors in high school, one from Glencoe and one from Long Lake -- who it appears are looking over the young "lads" from North Dakota???? Can it be true, Kim? How about it, Rachel? But Just Remember you Heard it from Hetty!!! I ran some household hints last time --Diana sent some addends to them so thought I would just send them with the added ideas Diana had: Now how about some of your time and/or effort saving ideas -- this could be a very helpful column if you help make it so! Here's a neat kitchen trick. To keep water from boiling over while doing noodles etc. Spray the rim with Pam or similar spray (would imagine any oil would work) No more messes on the stovetop! One of the things I remember from my school days was to come home and a big kettle of food was usually steaming on the range. Mom would make big kettles of chicken and dumplings, vegetable beef, or ham and bean soup for our suppers. Sometimes it was chili, rice, or pastas, but it always smelled so good, especially when the weather was cool. Another dish I remember as a youngster, and which I have rarely made is PIGS IN BLANKETS. I think I will make some one of these days and can freeze them in individual servings. One remembers recipes were a lot of just mixing ingredients together, no measurements ... Sometimes it said add a handful of flour, or butter the size of an egg, or a pinch of salt, or flavoring to season. Anyway -- all memory cooking was great! Pigs in Blankets requires a head of cabbage, onion, salt and pepper, hamburger, uncooked rice, tomato soup and ketchup. Steam cabbage in boiling water so leaves will be wilted. Mix rice, hamburger, salt and pepper, and onion into balls. Place a leaf of cabbage around each meatball and place rolls in roaster or Dutch oven seam side down so they don't unravel. Cover with tomato soup, water and ketchup. Bake in 375 oven for 2 hours or simmer an hour and half or until rice is soft. DELICIOUS. One cup rice.......I prefer Uncle Bens regular rice...it seems to hold up better. Just a dab of chicken base, if you have it. I have used homemade chicken stock and also a chicken bouillon cube, dissolved in the water. Wash and dry your chicken. Spray a 9 by 13 inch pan with Pam or similar spray. In a separate bowl, mix both cans of soup with two cans of water, rice and mushrooms and chicken base. Mix well. Pour into pan, and then place chicken on top of mixture. At 375 to 400 degrees, it takes about 1-3/4 hours. I always check it at 1 hour, just to be sure the rice mixture is cooking evenly ... adding a bit more water if necessary. I suspect some chicken leaches more grease than others, and that seems to make the difference in adding a bit more water. I also go very light on salt and pepper because of using the Lipton soup and chicken base, so a bit of trial and error may be required to get it to personal taste. The story about your new minister was just delightful and a real day brightener! What a wonderful and special man he sounds like! Just finished reading... I love the household hints section, we've got to keep that one going! So nice to hear from Shari's daughter. 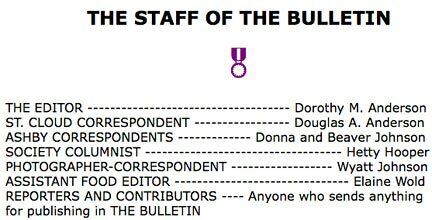 It seems like our "Bulletin family" is growing and growing! I liked all the little extras, or I should say, I lkeid all the ltitle etxars! Did you ever dream that this little newsletter you started would become so integral to our family unity? well, it sure has. Hats off to you, Mom! We have a big Paramount (Our local theatre, pretty snazzy) Gala opening today, so it's back to the rush, rush, rush. It's a living! QUOTATION FOR THE DAY: Feed your faith and your doubts will starve to death.